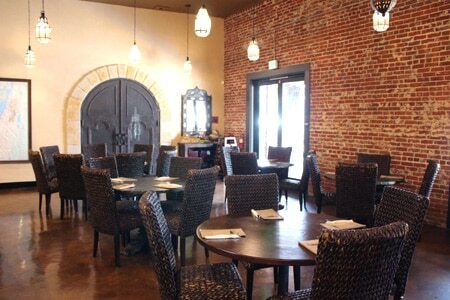 Comfortable downtown Fullerton venue serving up fresh, simple Mediterranean cuisine. : This spacious restaurant has many of the classic earmarks of a downtown Fullerton eatery: exposed brick walls; soft lighting; tall ceilings that create an open, airy ambience. The space is bound by a unique intimacy that stems from chef/owner Walid Alarja’s take on Mediterranean fare. Alarja’s unwavering commitment to simplicity and freshness results in robust, enticing dishes that capture the bright, uncomplicated essence that’s the hallmark of this cuisine when properly executed. We recommend kicking things off with a mix of hot and cold mezzas, such as the ideally zippy labne, or the beef, onion and pine nut-stuffed kubeh. Veggie-centric selections like the sliced white cabbage salad and the must-try fried cauliflower are also top options. The preparation of Mediterranean mains like the grilled lamb chops, chicken kebabs, and kefta (skewered, grilled ground beef and lamb with onions and parsley) allows the natural flavors to speak for themselves. Be sure to save room for the rice pudding or the intriguing house-made rose water ice cream. The menu is rounded out with a compact list of beer, wine and refreshing cocktails. Guests can hang out on the patio with a hookah, and a belly dancer provides entertainment each weekend. A sister location is at 955 E. Birch St., Brea, 714-990-0100.